Recently, we added a new category to this list: feature comment notifications. You know what’s better than an upvote? A featured comment. Featured comments is an easy way to highlight a comment that best captures an interesting insight or observation made in a discussion. In a busy and active thread, featuring a comment is also a method of curation. Furthermore, it helps steer an infant discussion in a certain direction so that the ensuing comments are civil, on-topic, and interesting. How are publishers using Featured Comments? Sites like Destructoid use it to recognize their commenters which has been shown to encourage more commenting activity. The Atlantic features comments from site moderators to invite readers to contribute to future stories. 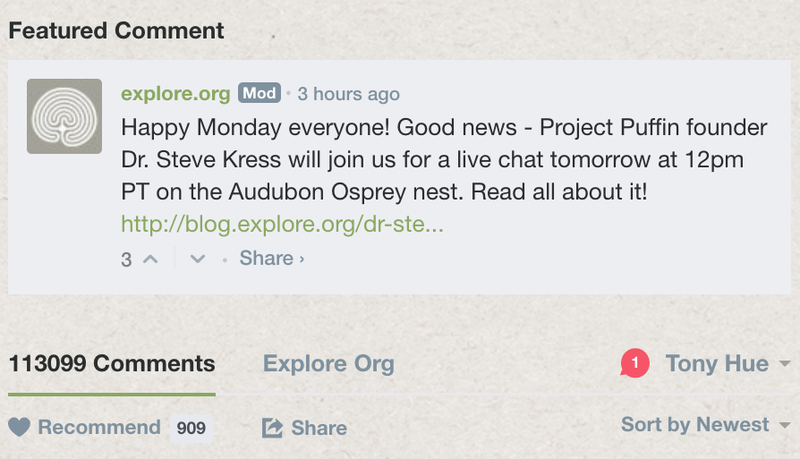 Explore.org features comments as a way to update and share announcements with their community. On Android Police, developers sometimes stop by to respond to a story about their app or product which gets featured to draw more attention from readers. Recognition deserves the proper reward and with this update, commenters can find out sooner that their contributions matter. Follow: Follow your site’s community on Disqus to find the latest discussions happening in your community. This also lets you moderate discussions on the Disqus iPhone app. We think these small enhancements are an important step towards closing the feedback loop between a site and its readers. Stay tuned for a follow-up announcement with user mentions. Back to you: How are you using featured comments to grow your community and increase engagement? Let us know in the comments below.